Take 5 For Mental Health is a printed directory of mental health services. It covers a range of issues to assist employees and their families. Our aim is to have a copy of this directory in every employees workplace and home! Small orders start at $10.00 per copy. Discounts apply to large orders. 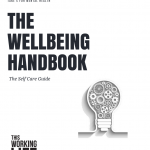 Workplace Wellbeing Employee’s Handbook is everything an individual needs to know about workplace stress and how to look after their own mental health, including evidenced based tools and tips. Small orders start at $25.00 per copy.